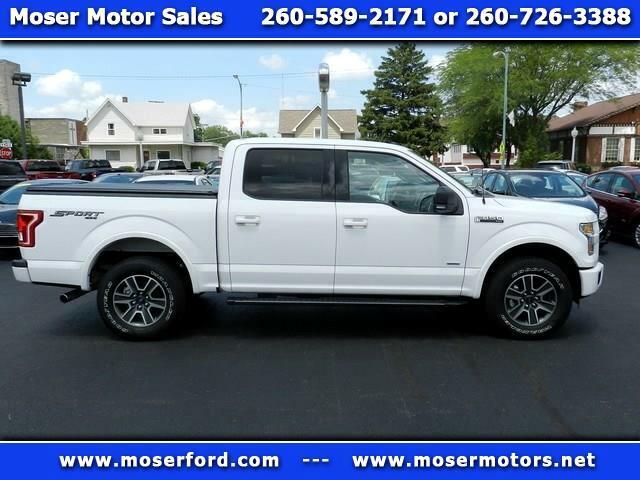 **TWIN PANEL MOONROOF **CLASS IV TRAILER HITCH **POWER SLIDING REAR WINDOW.2016 XLT F150 5 1/2 bed in Oxford White accented by 18-inch six-spoke machined aluminum wheels. FOUR WHEEL DRIVE. Lots of extras.Equipment Group 302A - Rearview Camera, Reverse Sensing, REMOTE START, Sync3, Satellite Radio, 110v Outlet, LED Box Lighting, Rear Window Defrost.Optional equipment included - 2.7L EcoBoost Engine with Auto Start/Stop Technology, Panoramic Sunroof, 6500# GVWR Pkg, Trailer Hitch IV, Manually Folding Mirrors with Power Glass, 23 Gallon Fuel Tank, XLT Sport Appearance Pkg.Review Snippet - "POWER. We're in a golden era for engine technology, and an automaker such as Ford can take a very small 2.7L V6 engine and tune it to make 325 horsepower and 375 lb-ft of torque. Eight years ago, the F-150's 5.4L V8 -- twice the displacement and two additional cylinders -- produced 25 fewer ponies and 10 fewer lb-ft of torque. "**This is NOT a Canadian truck. Call or text 2605892171.